Our goal is to provide a nurturing, developmentally appropriate environment that encourages each child to develop mentally, physically, spiritually, socially, and emotionally. Age appropriate learning experiences are provided to allow each child to progress at his/her own pace and to experience success through hands-on activities. You are now able to choose a 9:00 a.m. to 12:00 p.m. or 9:00 a.m. to 3:00 p.m. for your child. Children enrolled in the 9:00 a.m. to 3:00 p.m. program will need to provide lunch daily, which will be enjoyed in their classroom, as well as a nap mat for a short resting time after lunch. We follow the Okaloosa County School District calendar. 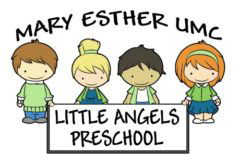 1- to 3-year-old program from 9:00 a.m. to 12:00 p.m.
1- to 3-year-old program from 9:00 a.m. to 3:00 p.m.
VPK – 4-year-old program from 9:00 a.m. to 12:00 p.m.
After Care for VPK Children – 4-year-old program from 12:00 p.m. to 3:00 p.m.